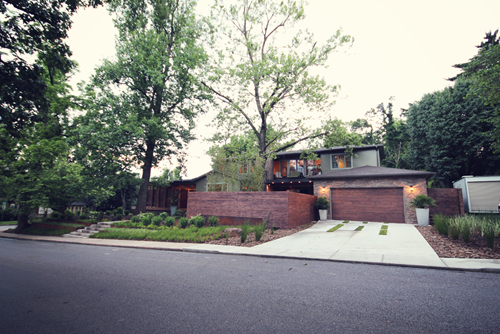 The Bingham Residence is a Modus Studio remodel and addition that was completed in 2010 in Fayetteville’s Wilson Park neighborhood. Fulbright's landscape architecture is formed around the large sycamore, walnut, and tulip trees which produce abundant shade. In order to respect these existing trees, minimal grading took place. A series of low, long rusted steel terraces, large Ozark boulders, custom lighting and locally-crafted concrete pots make up some of the projects most notable features.